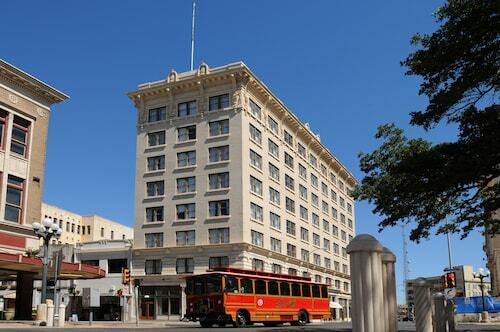 This 6-story hotel is located in the historic district, an approximate 1-block walk to the River Walk, and 4 blocks from the Alamo, Rivercenter Mall, and San Antonio Convention Center. This 14-story, Mediterranean-inspired hotel is on the Riverwalk, two blocks from the convention center, La Villita Historic Arts Village, and the Rivercenter Mall, and five blocks from the Alamo. 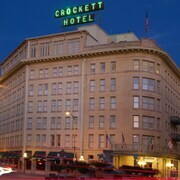 Situated in San Antonio, this hotel is 1.3 mi (2.2 km) from AT&T Center and 1.4 mi (2.3 km) from Freeman Coliseum. Fort Sam Houston and Splashtown are also within 6 mi (10 km). Grand Hyatt San Antonio is just off IH-37, on the San Antonio Riverwalk, adjacent to the Henry B. Gonzalez Convention Center. Rivercenter Mall is 1 block from the hotel, and the Alamo is 0.4 miles from the hotel. Located in Downtown San Antonio, this hotel is within a 10-minute walk of San Antonio Cavalry Museum, Alamo, and River Walk. 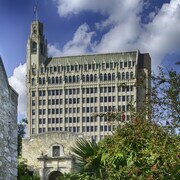 Henry B. Gonzalez Convention Center and San Antonio Majestic Theater are also within 15 minutes. San Antonio Station is 14 minutes by foot. 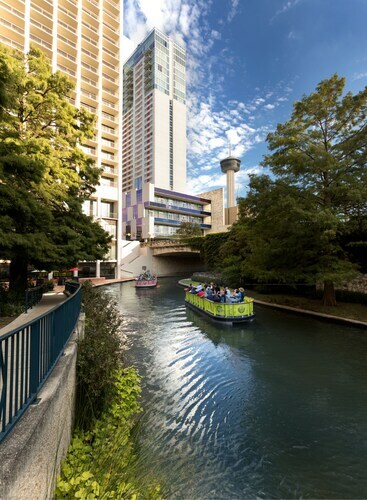 Red Roof Inn PLUS+ San Antonio Downtown - Riverwalk is a 15-minute walk from both the Alamodome and the eastern end of the San Antonio River Walk, which is lined with restaurants and shops. Guests can learn about the history and myths of the Alamo at the old fort itself, about a half-mile away. 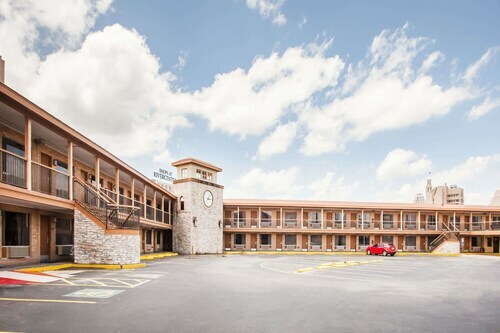 Situated in Universal City, this hotel is 1.5 mi (2.5 km) from Olympia Hills Golf Course and 2.4 mi (3.8 km) from Joint Base San Antonio-Randolph. Morgan's Wonderland and Rolling Oaks Mall are also within 9 mi (15 km). 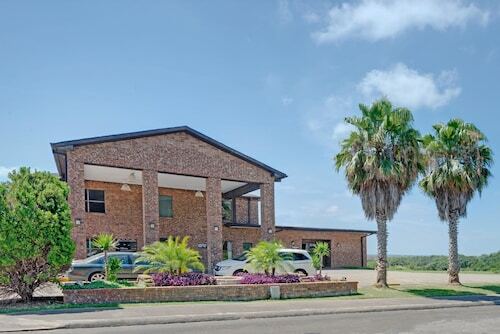 Situated in San Antonio, this hotel is within 3 mi (5 km) of USAA Corporate Office Headquarters, South Texas Medical Center, and University of Texas Health and Science Center at San Antonio. Huebner Oaks and CHRISTUS Santa Rosa Hospital - Medical Center are also within 3 mi (5 km). 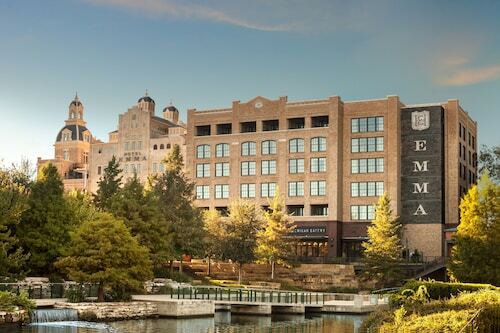 Located on a quiet stretch of the Riverwalk, this sophisticated hotel was once home to a 19th-century saddlery, and is a 3-block stroll to the Alamo; the convention center is just 6 blocks away. 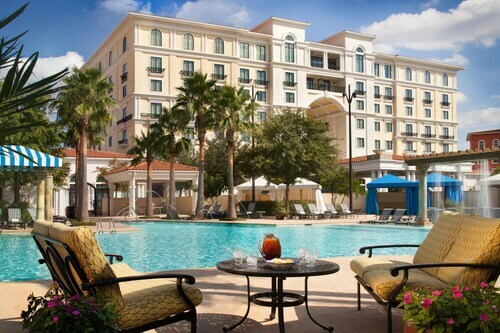 Set amid landscaped grounds and surrounded by rolling hills, Eilan Hotel and Spa, Ascend Resort Collection is a 20-minute drive from downtown San Antonio, including the Alamo and RiverWalk. 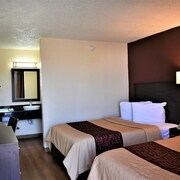 Six Flags Fiesta Texas and La Cantera golf and shopping are within 2 miles. 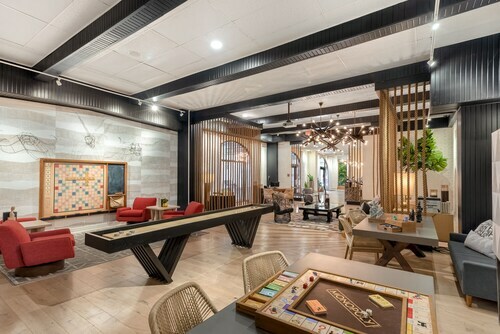 Set in a converted brewery in San Antonio's hip Pearl district, this elegant hotel is 15 minutes on foot from the 343-acre Brackenridge Park and golf course, and a 10-minute drive from McNay Art Museum. How Much is a Hotel Room in San Antonio? 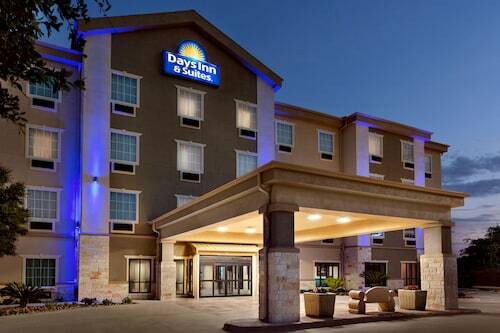 Hotels in San Antonio start at $37 per night. Prices and availability subject to change. Additional terms may apply. San Antonio seamlessly combines sepia-tone snapshots of the Old Southwest with hauntingly beautiful missions and thoroughly modern nightlife. 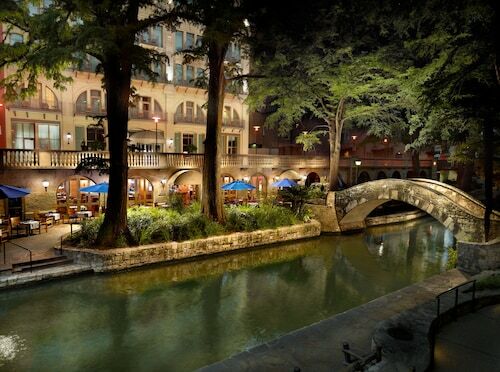 Take a few cues from the easygoing San Antonio River and go with the flow of street musicians’ melodies and savor the slow dip of the sunset from the balcony of beautiful San Antonio lodging. Speaking of the magic hour, when adventure calls to you, much like it beckoned to the cowboys of the wild west, ride off into the sunset in search of caverns and wildlife ranches, or simply settle in at a local pub for stories and a big plate of Texas barbecue. 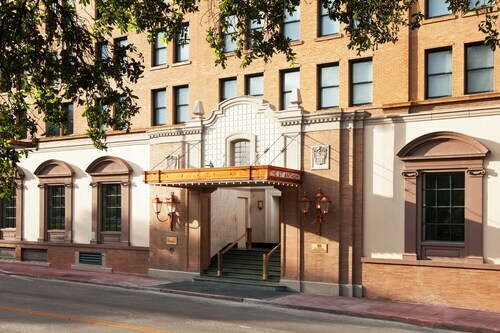 Hotel Valencia Riverwalk: When you want your getaway to start with a grand entrance, book the hotel’s limo service to shuttle you from the airport to the historic corner of Houston Street and St. Mary’s Street. Love the performing arts? Dress in your evening’s finest and walk a block to the Majestic Theatre one night and stroll two blocks south to the Aztec Theatre the next night. Or when you need a night in, enjoy the comforting combination of a crisp, contemporary aesthetic and dark neutral tones in the hotel bar or with a delicious in-suite meal on a private balcony. Hotel Contessa - Luxury Suites on the Riverwalk: Even the name speaks to your inner nobility, and once you see the bold décor you’ll want to strut your stuff right down to the riverbank, which will take about 30 seconds. Channel your inner count or contessa in the garden and exhibition halls of the Briscoe Western Art Museum, located right across the street or make several wishes on the fountains at nearby Hemisfair Park. If your wishes involve handcrafted gifts and one-of-a-kind art, then stop and peruse the antique shops and galleries at La Villita Historic Arts Village. After a long day exploring San Antonio’s vibrant arts scene, soak away the day like you’re rinsing the paint from brushes that just brought color to your masterpiece. 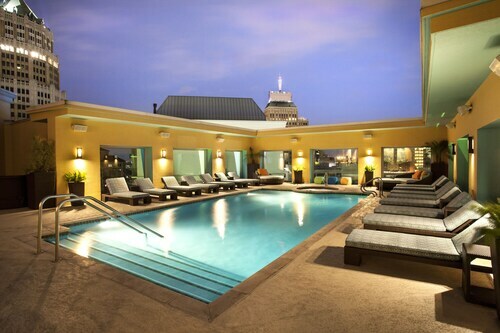 And by that we mean, take a dip in the hotel pool and add spirits in the form of a classic cocktail at the poolside bar. Omni La Mansion del Rio: Warm your spirit with the earthen tones of the Spanish colonial-inspired setting in the botanical courtyard or in your own suite. Tucked away along a quiet curve of the river, the Omni La Mansion del Rio only feels like one of the most secluded hotels in San Antonio, but don’t worry—it’s still within walking distance to the Alamo and the city’s top theaters. Experience the ultimate escape when you leave the energy of the city for the rejuvenating in-house spa. Sure, the Alamo is rustic, but San Antonio is also the perfect place to be pampered. 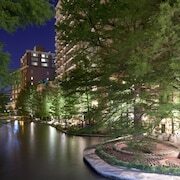 Hyatt Regency San Antonio Riverwalk: On the east side of the Riverwalk—with the Alamo in your sights—stay at the Hyatt Regency for the exquisite rooftop amenities and proximity to both casual and fine dining. When you aren’t in awe at the Alamo’s architecture or the exhibitions at Ripley’s Believe It Or Not, then take advantage of the nearby Tex-Mex cuisine options. Steak tacos and guacamole are comfort food at its finest. Before you grab your lazy river sunhat and head to the airport, book chic-cheap hotels near San Antonio with Travelocity. Our price-matching guarantee is a promise to offer you the best prices available on the best hotels in the world, starting right there in Mission City. Need insider tips on must-see attractions in San Antonio? Check out our San Antonio travel guide! I enjoyed my room. Wasn't wild about the surrounding area but I enjoyed pretty much everything at the hotel. Everything was great. Staff, amenities, food, everything.